The health benefits of cinnamon are well documented and its wide availability and powerful health benefits make this spice a super food for the Candida Diet! Cinnamon is obtained from the bark of the Cinnamomum tree. Though Cinnamomum cassia is what is commonly referred to as “cinnamon”, Cinnamomum verum or Cinnamomum zeylanicum is the “real cinnamon”. This healing spice has been used for thousands of years by people around the world to treat conditions like anorexia (loss of appetite), halitosis (bad breath), tooth decay, muscle spasms, joint pains, intestinal gas, nausea, vomiting, diarrhea, common colds, erectile dysfunction, menopausal symptoms and menstrual problems. Additional health benefits of cinnamon include being proven to have anticancer properties. It has also been shown to lower levels of the bad LDL cholesterol, total cholesterol and triglycerides. A study found that the health benefits of Cinnamon cassia include having antifungal properties (1). In this study cinnamon oil was found to destroy Candida albicans cells in the laboratory. Patients with Candida infection in the intestines were also give a capsule containing cinnamon and pogostemon oil and more than 70% were cured while improvements were noted in the rest. Another study found that Cinnamon cassia and its oil inhibited the growth of four species of Candida – C. albicans, C. tropicalis, C. glabrata and C. krusei (2). A study found that cinnamon reduces blood sugar levels (3). In this study persons with type 2 diabetes were given cinnamon each day and after 40 days they were found to have lower mean fasting blood glucose levels. Though the cinnamon they consumed ranged from 1 gram (half a teaspoon of cinnamon powder) to 6 grams (3 teaspoons), all participants who consumed it were found to have lower blood sugar levels. This is an important finding since person with diabetes are more prone to developing Candida infections because the yeast feeds on the sugar. By aiding the control of blood sugar, cinnamon can thus prevent and control these yeast infections. Regulating blood glucose levels can also reduce the sugar cravings that are worsened by blood glucose fluctuations and that develop due to Candida overgrowth. Additional health benefits of cinnamon include having anti-inflammatory properties (4) which are useful for alleviating the chronic inflammation associated with Candida overgrowth. It also contains antioxidants (4) which reduce the harmful effects of inflammation in the body. This spice is thus a useful effect for relieving the effects of Candida overgrowth. Cinnamon is a good source of fiber with 1 tablespoon (around 8 grams) providing around 4 grams of fiber. This fiber aids bowel regularity and can reduce the constipation associated with Candida colonization. Bowel regularity also helps with the removal of toxins from the body which assists in maintaining a balanced state that can reduces the overgrowth of Candida. A study found that cinnamon and cinnamon oil inhibited the growth of Escherichia coli (E. coli), Enterobacter aerogenes, Proteus vulgaris, Pseudomonas aeruginosa, Vibrio cholera, Vibrio parahemolyticus and Salmonella typhymurium (2). Infection with these bacteria can cause serious gut infections that require strong antibiotics for treatment. 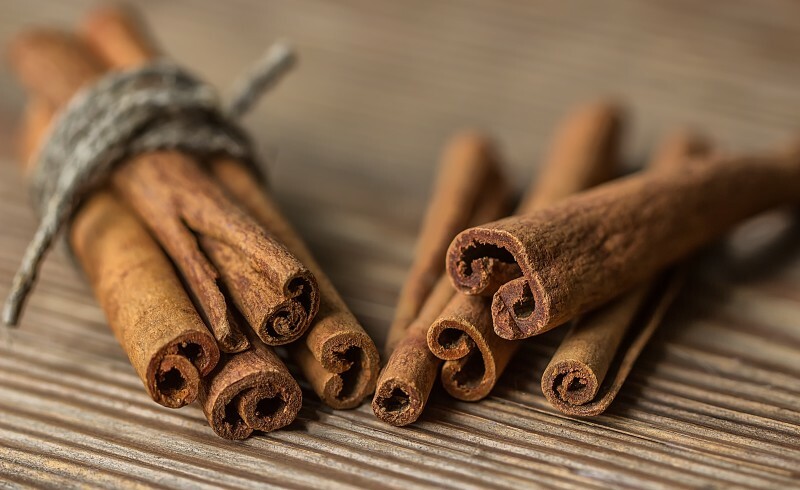 Consuming cinnamon can therefore keep the population of these bad gut bacteria in check and reduce the need for taking antibiotics that also destroy the good bacteria and contribute to Candida overgrowth. To reap these Candida healing benefits, cinnamon can be sprinkled on toast, cereal and other whole grain foods. It can also be added to smoothies and desserts. To prevent Candida from adapting to cinnamon, use it together with other antifungal herbs and spices like cumin, oregano, sage, cloves, garlic and ginger. C. cassia contains significant amounts of coumarin which can be harmful if consumed in large doses especially by persons with liver problems. However, C. cassia is cheaper and is what is commonly found in supermarket shelves. Regardless of the type you buy, cinnamon is considered safe when used to spice food. Nevertheless, when it is consumed in medicinal amounts it can cause side effects like irritation and sores on the lips and in the mouth. Persons with diabetes should use cinnamon cautiously since it can also lower blood glucose levels. Those taking medications that can potentially harm the liver like acetaminophen, carbamazepine, isoniazid and the antifungals fluconazole and itraconazole should avoid taking C. cassia since it can have similar effects. Persons taking antibiotics like isoniazid, erythromycin and heart medications like simvastatin (Zocor) should also avoid it for the same reason. The health benefits of cinnamon have been proven and people from around the world have benefitted from this powerful spice for years. For more information on other Candida Diet supplements click here.